A USAF C-17 Globemaster III from the 452d Air Mobility Wing takes off from nearby Riverside Municipal Airport, in March 2010. 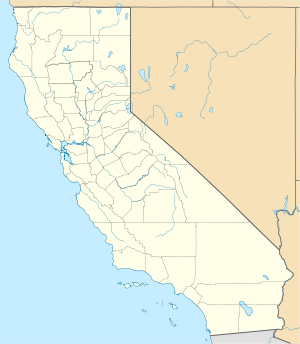 March Air Reserve Base (IATA: RIV, ICAO: KRIV, FAA Location identifier: RIV) (March ARB), previously known as March Air Force Base (March AFB) is located in Riverside County, California between the cities of Riverside and Moreno Valley. It is the home to the Air Force Reserve Command's 4th Air Force (4 AF) Headquarters and the host 452d Air Mobility Wing (452 AMW), the largest air mobility wing of the 4th Air Force. In addition to multiple units of the Air Force Reserve Command supporting Air Mobility Command, Air Combat Command and Pacific Air Forces, March ARB is also home to units from the Army Reserve, Navy Reserve, Marine Corps Reserve and the California Air National Guard. For almost 50 years, March AFB was a Strategic Air Command base during the Cold War. The host unit at March is the Air Force Reserve's 452d Air Mobility Wing (452 AMW), which in addition to its operational flying mission, also provides host base support for numerous tenant units. March JARB is also the home to Headquarters, 4th Air Force (4 AF) of the Air Force Reserve Command and multiple units of the California Air National Guard. Other activities at March ARB include F-16C/D alert site operations of the California Air National Guard's 144th Fighter Wing (144 FW), which is also operationally-gained by ACC. By late April 1918, enough progress had been made in the construction of the new field to allow the arrival of the first troops. The commander of the 818th Aero Squadron detachment, Captain William Carruthers, took over as the field's first commander and for a time operated out of an office in the Mission Inn. Within a record 60 days, the grain stubble-covered plain of Moreno Valley had been partially transformed to include twelve hangars, six barracks equipped for 150 men each, mess halls, a machine shop, post exchange, hospital, a supply depot, an aero repair building, bachelor officer's quarters and a residence for the commanding officer. Eventually March Field saw the construction of some 50 buildings. It covered over 700 acres and could accommodate up to 1,000 personnel. Dozens of wooden buildings served as headquarters, maintenance, and officers’ quarters. Enlisted men had to bivouac in tents. With the sudden end of World War I in November 1918, the future operational status of March Field was unknown. Many local officials speculated that the U.S. government would keep the field open because of the outstanding combat record established by March-trained pilots in Europe. Locals also pointed to the optimal weather conditions in the Riverside area for flight training. Cadets in flight training on 11 November 1918 were allowed to complete their training, however no new cadets were assigned to the base. Also the separate training squadrons were consolidated into a single Flying School detachment, as many of the personnel assigned were being demobilized. In the decade before World War II, March Field took on much of its current appearance and also began to gain prominence. Lieutenant Colonel Henry H. (Hap) Arnold, base commander from 1931 to 1936, began a series of well-publicized maneuvers to gain public attention. This resulted in a visit by Governor James Rolph in March 1932, numerous visits by Hollywood celebrities including Bebe Daniels, Wallace Berry, Rochelle Hudson and others, and visits by famous aviators including Amelia Earhart. Articles in Los Angeles newspapers also kept March Field in the news and brought to it considerable public attention. The completion of the first phase of permanent buildings in 1934 added to the scenic quality of the base. After the war, March was assigned to the new Tactical Air Command (TAC) as part of the postwar reorganization of the Army Air Force. March was allocated to TAC's Twelfth Air Force. The first TAC unit to be assigned was the 1st Fighter Group, under the command of Col. Frank S. Perego, being reactivated at March on 3 July 1946, replacing and absorbing the assets of the wartime 412th Fighter Group. At the time of its activation, the group's three squadrons (the 27th, 71st, and 94th Fighter Squadrons) flew Lockheed P-80 Shooting Star (after 11 June 1948 F-80), America's first operational jet fighter. On 15 August 1947, the 1st Fighter Wing was activated as part of AAF Regulation 20-15, "Reorganization of AAF Base Units and Installations," on 27 June 1947. This regulation, which laid out what became known as the "Wing" or "Wing-Base" plan, prescribed a standard organizational setup for all Army Air Force bases worldwide. The plan called for the creation of a wing headquarters that established policy and supervised four functional groups: an operational group, an air base group, a maintenance and supply group, and a medical group. The 1st Fighter Group became the operational group of the new Wing. In 1947, the 67th Tactical Reconnaissance Group (later Wing) was activated as part of a service-wide, wing-base test and assigned to March. When the wing was activated, only the 67th Reconnaissance Group was fully operational. The group was equipped with Douglas FA-26 Invaders (RB-26 after 1948) and Lockheed FP-80's (RF-80s after 1948) and was integrated with the 1st Fighter Wing, performing a wide array of day and night photographic missions in southern California. Budget constraints, though, resulted in the wing's inactivation in March 1949. On 1 May 1949, March became a part of the Strategic Air Command and the Fifteenth Air Force. On 10 May, the 22d Bombardment Wing was reassigned to March from Smoky Hill Air Force Base, Kansas. The 22d was equipped with the Boeing B-29 Superfortress. The 1st Fighter Wing was subsequently attached to the 22d BW on 1 July as the 22d Wing's headquarters was initially non-operational and its operational components were detached so it shared a commander with the 1st Fighter Wing. The 22nd Bomb Wing became operational on 1 May 1949 and the 1st Fighter Wing was attached to it with both wings sharing the same commanding officer. Following the return of the 22d Bombardment Group from Korea, the wing trained for proficiency in global strategic bombardment, and in 1952, the wing took delivery of Boeing KC-97 tankers, adding aerial refueling to its mission. The following year, the wing retired its B-29 fleet and replaced them with the jet-powered Boeing B-47 "Stratojet". In 1954, 22d Wing aircrews flew the longest non-stop mass flight in history: 5,840 miles (9,400 km) from England to California. General Archie Old, the Fifteenth Air Force commander, led a flight of three B-52 Stratofortresses in a flight around the world. The wing deployed to RAF Upper Heyford, England from December 1953 to March 1954. In 1960, the 452d Troop Carrier Wing was activated at March. This established the presence of the Air Force Reserve on the base with their Fairchild C-119 Flying Boxcars. 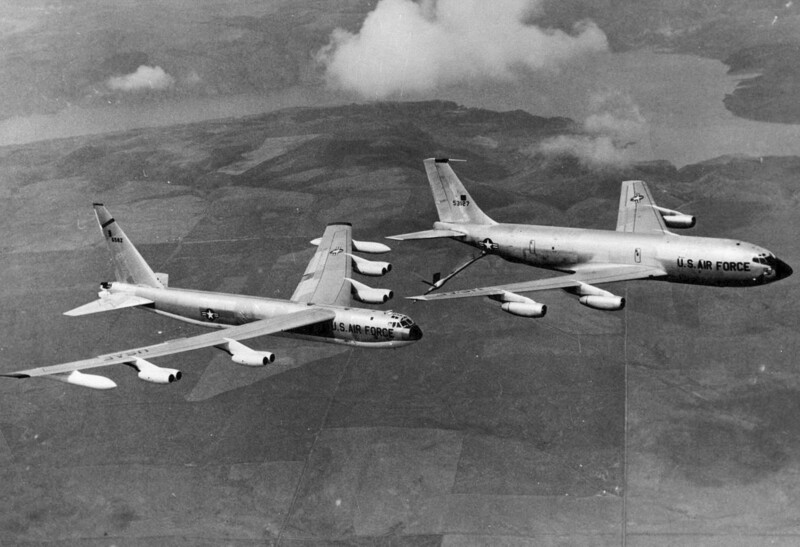 The wing was not tactically operational 11 March – 15 September 1963, while the 2nd Bombardment Squadron converted to Boeing B-52B bombers and KC-135 jet tankers replaced the KC-97s. In 1966, the 2d Bomb Squadron converted to the B-52D and gained a commitment to forward deploy to the Pacific and engage in combat during the Vietnam War. In 1966, the wing absorbed the B-52Ds and added the 486th Bombardment Squadron from the 340 Bomb Wing at Bergstrom AFB, Texas when Bergstrom converted to a TAC Reconnaissance base. The addition of a second tanker and bomber squadron made the 22d a "Super" wing. The 22d maintained a strategic bombardment alert posture from 1973–1982, but in 1978 it added conventional warfare missions, including mine-laying and sea reconnaissance/surveillance. After the retirement of the B-52D in 1982, the 22nd Bombardment Wing was renamed the 22d Air Refueling Wing and re-equipped with new KC-10A Extenders (based on the DC-10 airliner), making the 22nd the second Air Force unit to use the giant new tankers. Two months later, the wing lost its bomber mission and became the 22nd Air Refueling Wing. The 22nd used the KC-10A's cargo, passenger, and fuel load capacity to provide support during the evacuation of U.S. nationals as part of the invasion of Grenada in 1983. In December 1989, the wing's 22nd Air Refueling Squadron inactivated and all its KC-135A Stratotankers were retired or transferred to other SAC bases. This left the KC-10-equipped 6th and 9th ARS's as the wing's only flying squadrons. The base was listed on the National Priorities List as a Superfund site on 21 November 1989. In March 1993, March was chosen for realignment under the Base Closure and Realignment [BRAC] III with an effective date of 31 March 1996. In August 1993, the 445th Military Airlift Wing transferred to March from the closing Norton AFB in nearby San Bernardino. On 3 January 1994, the 22d Air Refueling Wing was reassigned without aircraft to McConnell AFB, Kansas, replacing the inactivating 384th Bomb Wing. The Air Force Reserve 722d Air Refueling Wing stood up at March and absorbed the assets of the reassigned 22d. March's KC-10A aircraft assets would later be transferred to the 60th Airlift Wing, redesignated as the 60th Air Mobility Wing, at Travis AFB, California. Curtiss P-36A Hawks of the 17th Pursuit Group, 7 November 1939. The population was spread out with 156 people (13.5%) under the age of 18, 36 people (3.1%) aged 18 to 24, 155 people (13.4%) aged 25 to 44, 246 people (21.2%) aged 45 to 64, and 566 people (48.8%) who were 65 years of age or older. The median age was 63.0 years. For every 100 females there were 106.2 males. For every 100 females age 18 and over, there were 103.4 males. In the base the population was spread out with 37.0% under the age of 18, 8.1% from 18 to 24, 35.1% from 25 to 44, 14.9% from 45 to 64, and 4.9% who were 65 years of age or older. The median age was 29 years. For every 100 females there were 111.4 males. For every 100 females age 18 and over, there were 111.8 males. In the state legislature March ARB is located in the 37th Senate District, represented by Republican Bill Emmerson, and in the 64th and 65th Assembly Districts, represented by Republicans Brian Nestande and Paul Cook respectively. Federally, March ARB is located in California's 44th and 45th congressional districts, which have Cook PVIs of R +6 and R +3 respectively and are represented by Republicans Ken Calvert and Mary Bono Mack. March Field Air Museum – The Museum is located off the grounds of the Base and displays in its aircraft collection examples bombers, fighters, cargo, refueling and reconnaissance aircraft, many of which served at March Field, March AFB and/or March ARB. Butler, William J. (2009). Images of America: March Air Force Base. Charleston, SC: Arcadia Publishing. pp. 127. ISBN 978-0-7385-7159-1. Maurer, Maurer, ed (1983) . Air Force Combat Units of World War II (reprint ed.). Washington, DC: Office of Air Force History. ISBN 978-0912799025. OCLC 9644436. http://permanent.access.gpo.gov/lps48183/af_combat_units_wwii.pdf. Mueller, Robert (1989). Air Force Bases, Vol. I, Active Air Force Bases Within the United States of America on 17 September 1982. Washington, DC: Office of Air Force History. ISBN 0-912799-53-6. http://www.afhso.af.mil/shared/media/document/AFD-100921-026.pdf. Ravenstein, Charles A. (1984). Air Force Combat Wings, Lineage & Honors Histories 1947–1977. Washington, DC: Office of Air Force History. ISBN 0-912799-12-9. http://www.airforcehistory.hq.af.mil/Publications/fulltext/combat_wings.pdf. ↑ "US 4th Air Force". http://www.4af.afrc.af.mil/. Retrieved 23 November 2010. ↑ Soifer, Jerry (1 May 2010). "Crowds get an up-close look at F-22 Raptors at March Airfest in Moreno Valley". The Press Enterprise. http://www.pe.com/localnews/morenovalley/stories/PE_News_Local_W_wair02.489dcd8.html. Retrieved 18 September 2010. ↑ 4.0 4.1 Armed Services Press, Welcome to March Air Force Base – 1971 Unofficial Guide and Directory, Riverside, California, 1971, page 3. ↑ 6.00 6.01 6.02 6.03 6.04 6.05 6.06 6.07 6.08 6.09 6.10 6.11 6.12 6.13 6.14 6.15 6.16 6.17 6.18 6.19 6.20 6.21 6.22 6.23 6.24 6.25 6.26 "History of March Air Force Base". Marchfield.org. http://www.marchfield.org/history.html. Retrieved 23 November 2010. ↑ 8.0 8.1 8.2 8.3 8.4 8.5 8.6 8.7 "The 452nd Air Mobility Wing". March Air Reserve Base. http://www.march.afrc.af.mil/library/factsheets/factsheet.asp?id=3659. Retrieved 18 September 2010. ↑ "March Air Force Base Superfund site progress profile". EPA. http://cfpub.epa.gov/supercpad/cursites/csitinfo.cfm?id=0902761. Retrieved 26 April 2010. ↑ Muckenfuss, Mark (3 December 2010). "Newsletters | Share Riverside: March Air Reserve Base gets new squadron". The Press Enterprise. http://www.pe.com/localnews/stories/PE_News_Local_D_squadron04.48fa8d1.html. Retrieved 4 December 2010. ↑ Trone, Kinberly (11 December 2004). "DHL Picks March". The Press-Enterprise. pp. A1. ↑ "DHL to unload U.S. operations, close West Coast hub in Riverside". The Press Enterprise. 10 November 2008. http://www.pe.com/localnews/suncity/stories/PE_News_Local_S_dhl11.40f1ed8.html. Retrieved 18 September 2010. ↑ "March air base gets tentative OK for general aviation". The Press Enterprise. 5 May 2008. http://www.pe.com/localnews/riverside/stories/PE_News_Local_D_faa06.2f43b1a.html. Retrieved 18 September 2010. ↑ 15.0 15.1 "Civilian aircraft rocket to top of March Joint Powers Commission's agenda". The Press Enterprise. 7 May 2008. http://www.pe.com/localnews/inland/stories/PE_News_Local_D_planes08.406df4b.html. Retrieved 18 September 2010. ↑ "US Gazetteer files: 2010, 2000, and 1990". United States Census Bureau. 2011-02-12. http://www.census.gov/geo/www/gazetteer/gazette.html. Retrieved 2011-04-23. ↑ "2010 Census P.L. 94-171 Summary File Data". United States Census Bureau. http://www2.census.gov/census_2010/01-Redistricting_File--PL_94-171/California/. ↑ "Will Gerrymandered Districts Stem the Wave of Voter Unrest?". Campaign Legal Center Blog. http://www.clcblog.org/blog_item-85.html. Retrieved 10 February 2008.